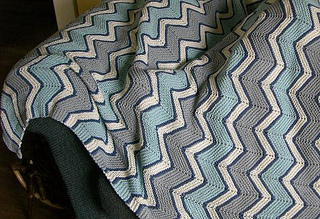 Errata: The pattern repeat is a multiple of 24 stitches + 12 (not 12 + 12), so the correct number to cast on is 252 (for 10 zig-zags plus the selvedge stitches). This afghan is patterned after one my grandmother made for me when I was a teenager. My teen-aged boys love it as it is nice and roomy. Updated to use a natural fiber yarn rather than acrylic and color palette chosen by my eldest son.